Concentration & Focus: This contributes to a better learning & achievement in school. Discipline & Self Control: Results in a sense of responsibility & better overall behavior. Respect of Self & Others: Your child will lead to a bully free life & live a life of showing kindness to others. Confidence: Equals an ‘I CAN DO IT’ attitude. Confidence will drive your child to become a leader & to help them steer away from negative peer pressure. Self-esteem: Your child will develop a good opinion of themselves. Goal Setting: They will learn to set & attain goals which will lead to a good feeling of accomplishment. Physical skills: Your child will show growth in their physical performance, advanced coordination, flexibility, strength, & overall fitness. 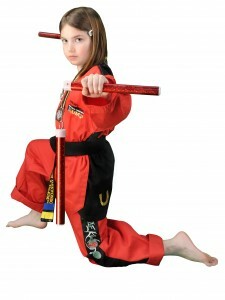 Martial Arts Techniques: Are an invaluable tool your child can use to defend themselves if they find themselves in a bad situation. Positive Community: Belonging to a positive community helps instill positive thinking so your child can become a good role model. Good Moral Values: An extension of the good moral values you teach at home helps your child develop into a confident, kind, respectful adult. Friendships: Your child will make new friends with similar interests & goals. 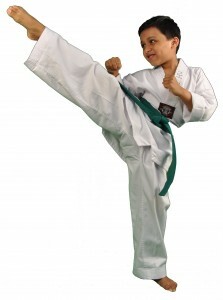 THE BEST PART IS, FROM YOUR CHILD’S POINT OF VIEW…TAEKWONDO IS FUN!